One of the new features in iMovie 11 is movie trailers. You can use movie trailers to entice potential viewers, entertain YouTube visitors, or salvage and use the best parts of a movie that didn't turn out quite right. Creating a movie trailer is easier than you might think. 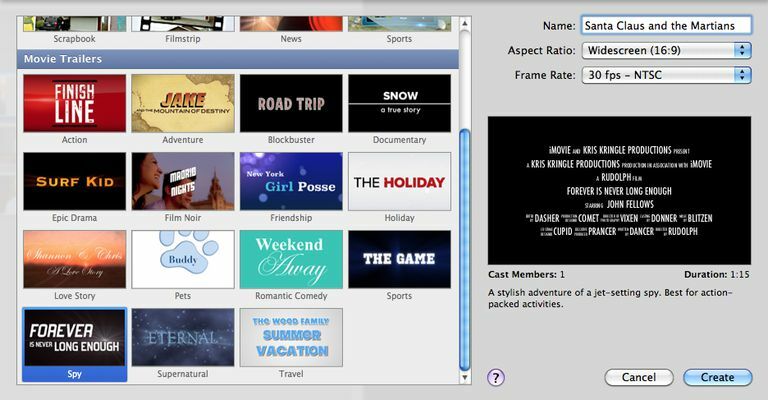 Select one of 15 movie genres, complete a simple outline, and select some appropriate clips for the storyboard (a visual outline of a movie or animation). There's not much more to it than that. The most difficult, or at least most time-consuming, part of creating a movie trailer is finding the right footage to use. After all, a trailer is supposed to highlight the best parts of a movie. But don't worry too much about that for your first few trailers; just have fun. We used a clip from "Santa Claus Conquers the Martians," a low-budget sci-fi flick from the early '60s, to create our movie trailer. You'll find a number of copyright-free films on the Internet Archive website that are fun to experiment with; you can also use any of your own movies, of course. If you've already imported the movie you want to use, select it from the Event Library. If you haven't already imported the movie you want to use, you'll need to do that first. From the File menu, select Import from Camera if the footage you want to use is still in your camera, or Import if the footage you want to use is on your computer or local network. iMovie will import the movie into your Event Library. This may take several minutes or more, depending on the size of the movie. When the import process is finished, select the movie from the Event Library. From the File menu, select New Project. Enter a name for your project in the Name field, and then select an aspect ratio and frame rate. There are 15 templates (genres) to choose from (Action, Adventure, Blockbuster, Documentary, Drama, Film Noir, Friendship, Holiday, Love Story, Pets, Romantic Comedy, Sports, Spy, Supernatural, Travel), which sounds like a lot, but it's actually a little limited. How could Apple have left out the Bad Sci-Fi genre? There's no entry for comedy (other than romantic comedy), either. None of the choices really fit our movie, but we selected Adventure as the closest match. When you click on one of the templates, the right side of the dialog box will display a stock trailer, to give you a feel for that particular genre. Underneath the trailer, you'll see the number of cast members the trailer is designed for, plus the duration of the trailer. Most trailers are designed for one or two cast members, although a couple are designed for as many as six cast members, and a couple have no designated number. Trailers run from about a minute to a minute and a half. When you're satisfied with your selection, click Create. There's one important thing to be aware of: Because each template includes different information, they're not interchangeable. Once you select and start working with a template, you're committed to it. If you want to see your trailer in a different template, you'll have to recreate it again from scratch. The left side of the Project area will now display a tabbed interface, with three tabs: Outline, Storyboard, and Shot List. The contents of each tabbed sheet will vary, depending on the template you chose. On the Outline sheet, you enter basic information about your movie, including movie title, release date, major cast members, studio name, and credits. Each placeholder must contain information; if you try to leave a placeholder blank, it will return to the default text. After you enter a fictitious studio name, you can select a logo style from a pop-up menu. When you select a logo style, such as Glowing Pyramid, it will display on the right. You can change the logo style, as well as any of the other information on this sheet, at any time. There's no option to customize the logo, however. When you're finished with the Outline information, click the Storyboard tab. A storyboard provides a visual map of the sequence of a movie or animation. In this case, some of the elements of the storyboard have already been determined. You can edit any of the onscreen text, but you should select clips from your movie that fit the storyboard. For example, the second part of the storyboard for the Travel template is set up for an action shot, a medium shot, and a wide shot. You build your movie trailer by adding video clips to each of the placeholders in the storyboard. Don't worry too much about the length of a clip; iMovie will adjust it to fit the allotted time slot. It may be helpful to remember that the overall length of the trailer is less than a minute-and-a-half (and in some cases, less than a minute), so each of the clips should be fairly short. If you change your mind about a clip you chose for a placeholder, you can delete it or you can just drag another video clip to the same placeholder; it will automatically replace the previous video clip. The Shot List sheet shows the clips you've added to the trailer, organized by type, such as Action or Medium. If you want to change any of your selections, you can do it here, as well as in the Storyboard sheet. Just select a new clip, then click and drag it over the clip you want to replace. To view your movie trailer, click one of the Play buttons in the upper right corner of the Project area. The left Play button (black right-facing triangle on a white background) will play the trailer full screen; the right Play button (white right-facing triangle on a black background) will play the trailer at its current size, to the right of the Project area. If you choose to watch the trailer full screen, you can return to the normal iMovie window by clicking the white x in the lower left corner of the screen. When you're happy with your movie trailer, use the Share menu to share it via YouTube, MobileMe, Facebook, Vimeo, CNN iReport, or Podcast Producer. You can also use the Share menu to export your movie trailer for viewing on a computer, an Apple TV, an iPod, an iPhone, or an iPad.